Between all the bubbles, the special methods for opening the bottle and the unusual glasses, sparkling wine can appear much more complicated than it really needs to be. And why should we call it sparkling wine instead of Champagne? There are many methods for making sparkling wine. The most famous is “methode champenoise,” or made in the same traditional method as it is in Champagne (and, confusingly, that is OK to put on a bottle of sparkling wine). This means the wine is fermented twice. The first is the same way any still wine is made, while the second is in the bottle. When yeast converts sugar to alcohol, it creates carbon dioxide, and when carbon dioxide is trapped in a bottle or other enclosure, it creates bubbles. Those are the basics; in reality, it’s pretty complicated. Another way to make sparkling wine is called “charmat.” In this method, the second fermentation occurs in a tank rather than a bottle. This is how most Italian wines are made. A third way is to inject carbon dioxide into the wine in a tank, kind of the way Coke and Pepsi are produced. What kinds of grapes are used to make sparkling wine? Any grape can be used. Traditionally, Champagne uses Chardonnay, Pinot Noir and Pinot Meunier. 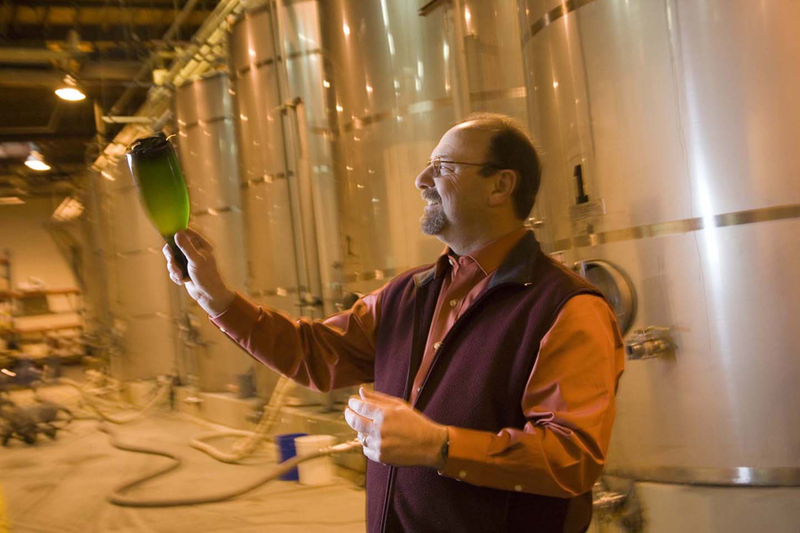 Northwest winemakers typically use Chardonnay and Pinot Noir, but we also see Riesling, Gewürztraminer, Pinot Gris and even Syrah used to make bubbly. In other words, there are no hard and fast rules in the New World. What is the proper way to open a bottle of bubbly? Popping the cork on a bottle of sparkling wine can be tricky. If you actually pop the cork, you risk hurting yourself or, more importantly, spilling perfectly good bubbly. The first step to properly opening a bottle of sparkling wine is to chill it well. Do this by leaving it in the fridge for a few hours or dunking it in an ice bath for 20 minutes or so. Before you open the bottle, make sure you have a kitchen towel handy. Then remove the foil and carefully take off the “cage” (the wire thing covering the cork) without pointing the end of the bottle at anyone. As much as you can, keep a thumb securely on top of the cork while you take off the cage; there is a chance the pressure in the bottle will push the cork out before you’re ready. Next, place the towel over the top of the bottle and get a good grip on the cork. With the other hand, hold the bottom of the bottle and slowly twist it back and forth, loosening the cork. You’ll eventually feel the cork come loose and release with a sigh rather than an explosion. Here’s a video on how to do it right (and wrong). What kind of wine glass should used for sparkling wine? You can drink sparkling wine from any glass you want. In fact, a standard white wine glass will work perfectly well and allow you to swirl and smell the wine’s beautiful aromas. However, sparkling wine is traditionally drunk from a tall, thin glass known as a flute. The shape of this glass provides a more dramatic presentation of the bubbles. Whatever you do, avoid the “champagne saucer” or “coupe” used at wedding. This bowl-shaped glass allows the bubbles to dissipate quickly and takes away from the enjoyment of the wine. Save it for your next margarita. Tradition holds that the coupe is the shape of Marie Antoinette’s breasts. It’s a nice story, even if it isn’t true. How do you decipher the label on sparkling wine? In most cases, we have removed the mystery of wine in the New World. We tend to use varietal names rather than regions (as they do in the Old World). But that doesn’t happen with sparkling wine, where the labels need a bit of deciphering. Blanc de Noirs: This means a white wine made from red (literally “black) grapes. This is usually Pinot Noir, but it can be anything. And often a Blanc de Noirs is pink rather than clear. Blanc de Blancs: This is a white wine made with white grapes, such as Chardonnay (but also Riesling, Pinot Gris, Chenin Blanc, etc.). Brut: This is a dry sparkling wine. Extra Dry: This defies common sense, but an “extra dry” sparkling wine actually means a sweeter wine. There’s a lengthy and somewhat logical explanation of this, but let’s just shrug our shoulders and chalk it up to those crazy French. Cava: This is a Spanish sparkling wine. Spumante: This a style of Italian sparkling wine. There’s also Prosecco and Frizzanté wines, which are lighter in style. Chefs love sparkling wines because they are so versatile with food. They work with spicy Asian or Mexican dishes, as well as seafood, shellfish, chicken and cheeses because of their bright acidity, absence of tannin and lower alcohol. So why is sparkling wine so typically known for celebrations? It’s probably because of the pop of the cork and the happy bubbles. So go celebrate life with a bottle of bubbly, preferably on a weekly basis.